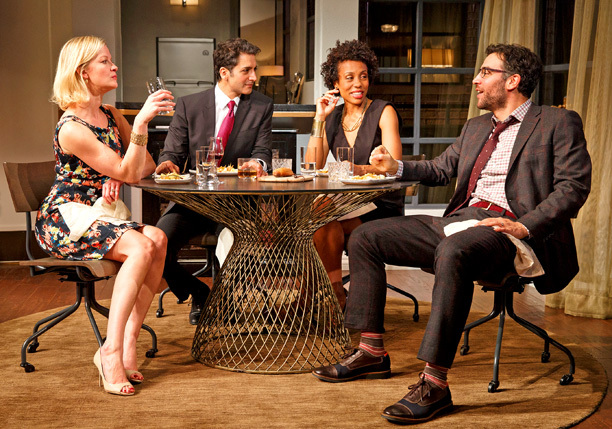 Ayad Akhtar’s topical play Disgraced, the worthy winner of last year’s Pulitzer Prize for drama, continues a long tradition of theater that explores the costs of assimilation for minority groups in the great American melting pot. Now on Broadway with a star-studded cast, including the fine Gretchen Mol as the wife of a Pakistani-American lawyer who trips up over the heightened suspicions of Muslims in post-9/11 America. The smart one-act script still holds up, though the British actor Hari Dhillon doesn’t quite match the coiled intensity of Aasif Mandvi, who first played the deeply conflicted Amir Kapoor in Lincoln Centre’s Off Broadway production two years ago. Read my B+ review at EW.com.